March 14 , by Barbe Saint John. For this weeks Artist Interview, I am VERY excited to be able to introduce you all to someone that I am proud to be friends with – the EXTREMELY Talented Ms. Carter Seibels of Divali Glass Jewelry. Carter and I met shortly after she moved to the Bay Area about 2 or 3 yrs ago. She is as lovely a person as she is talented. Her work is sold in juried art shows, galleries and boutiques across the country as well as her online shop. Carter started working with glass in her teens and her passion for it shows in her work. Photographs can not do justice to her work, the colors are so vibrant and the energy is so alive in person. Please check her list of galleries and check out her work in person. You started with working with glass when you were really young, has it always been ‘glass’ or have did you try other jewelrymaking things before you found lampworking? I was obsessed with jewelry from the time I was old enough to walk. I have baby-pictures of myself wearing more necklaces than I could fit on my neck. My Grandmother says my Great-Grandmother was “the orignial hippie” of South Carolina, and she loved beads. Apparently she had stashes of beaded jewelry, but they all got scattered before I came around. So I think I came by the bead thing naturally! I used to make really wide, intricately knotted Friendship Bracelets in middle school and high school. I think the things I used to do were museum-quality pieces, but I didn’t think anything of it at the time. It was just something that I enjoyed doing, and the more I did it, the better I got. So that was my first venture in jewelrymaking. Then I found beads, and haven’t looked back since! Do you remember the first piece of glass jewelry you ever made and do you still have it? But of course! My Grandmother is the lucky owner, and she still wears it on a regular basis. 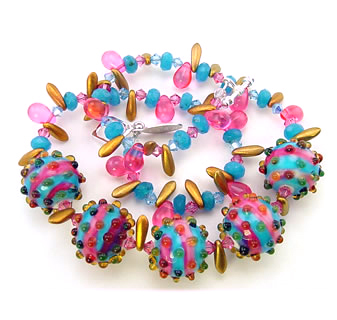 It’s similar to my current Serendipity style– lots of beads that are all different in shape, color, and pattern. Pretty big beads, as most beginners tend to work big. But amazingly, it’s one of the few first pieces that I can still stand to look at. Your business name ‘Divali’ is beautiful, meaningful and very fitting for you and what you do. How did you come about choosing it? I couldn’t come up with a name, and couldn’t open a business account until I came up with a name. I stumbled upon the name “Divali” in a book about the aura, although I can’t remember what the context was now. Anyway, when I looked into the meaning, the name became even more appealing. Divali is the Hindu Festival of Lights, much like our New Year’s celebration. It is a very colorful and festive occassion, with candles and color everywhere. I thought it was a perfect match for bright, colorful jewelry made in the flame of a torch. And the name stuck! How has your glasswork changed since you began? Hmmm…that’s a tough one, but fun to think about. Obviously, my lines have gotten cleaner, my precision much better, and my overal skill allows for more complicated processes. Other than that, I think my style of creating has changed, as I tend to focus more on the intricacies and unique quality of the finished piece of jewelry, rather than aimlessly making beads. In the past two to three years, I have been drawn more towards making focal beads, and finished necklaces that have a focal point. I have recently been drawn to using the vibrant colors of vintage lucite beads as inspiration and accents for my glass beads, and it’s fun to work with those often unexpected color combinations. When we met you were working a ‘9-5’ job, are you still doing that or are you doing Divali Glass fulltime now? I joke that I have two ‘9-5’ jobs: both Divali Glass Jewelry, and manager/co-owner of www.BeadTrust.com . I actually made my jewelry full time for about 3 years just out of college, before I moved here. But I moved to CA to work with a wholesale bead company, becuase I realized I was going to get old fast doing shows every weekend, and never get (financially) ahead. Working with a bead company was about the best job I could ever dream of, so I took the offer. That evolved into creating Bead Trust, a retail bead website. So now I am completely surrounded by beads! But the beauty of doing what you love is that it (usually) doesn’t feel like work; it’s merely waking up every day doing what comes naturally. You’ve lived out here a while now, how has living on the West Coast influenced your work? I tend to pay more attention to the fashion trends here. I think being so close to San Francisco and having the influence of the young, hip crowd of the Bay Area has encouraged me to keep an eye on what’s trendy, and then translate that into my own style. Also, living in an area where I am able to take classes at any of dozens of art/craft/educational institutions has allowed me to dabble in things I would never have been exposed to back in South Carolina. So the new mixed-media line that I am working on is a direct result of learning new techniques and taking classes at facilities like The Crucible. You’ve been VERY successful and won a lot of awards, where do you want to go next with your work? Thanks! It’s fun to think about how far I’ve come, and all that I have been able to accomplish in the 8 years I’ve been in business. My own journey is an inspiration in itself, and enough to push me even farther along my path. I have been working on coming up with some styles that are targeted to an audience more my age. My average customer is a middle-aged female, and I would like to work towards filling out my product line so that I have more to offer the 20 to 30-somethings. Also, I am currently working on incorporating other mediums into my finished pieces. I have always been drawn to mixed media jewelry, and I am on the verge of creating a very exciting new line mixed media work using glass, PMC, and resin. It’s the first time in a few years that I feel like I have really come up with something new, and it’s very invigorating. I get butterflies in my stomach when I work on these new pieces! Stay tuned, I can promise you some exciting work in the very near future. Your passion for glass and jewelry is infectious so I have to ask – Do you plan on doing any teaching in the future? www.divaliglassjewelry.com, especially my blog, for details. Thats exciting!!! OK, so what tips do you have for budding lampwork artists or those about to get started? Don’t be scared of the fire! Don’t spend too much time looking at other bead artist’s work, because you want to find a voice of your own. I am almost completely self-taught, and although it was frustrating at times, I am so glad because I developed my own style of work that is distinctive from that of other bead makers. If you are constantly looking at other people’s work, subconsciously, you will make what they make. Think outside of the box. Challenge yourself both technically and creatively. Do you have any big/exciting news you’d like to share? Yes, but it’s still a bit of a secret. Here are some hints: it involves teaching, a new studio space, and a place where Divali Glass Jewelry will be more accessible to the public. It’s all about beads, in Berkeley, and it’s going to revolutionalize the local bead scene as we know it. Stay tuned to www.divaliglassjewelry.com and www.beadtrust.com for more details. Cool!!!!! I can not WAIT to see what comes together! I’ll be posting more about Carter and her upcoming projects as soon they are ready, I know its going to be AMAZING. Be sure to visit her site, blog and if she is at a show you are attending-say Hello to her! And thank you to Carter for this interview, you rock!! Had to chuckle at the comments regarding art shows as we have experienced the same thing. The handmade glass jewelry world is small and it’s great to see fellow artists telling their story, sharing their insights and inspiring us all.